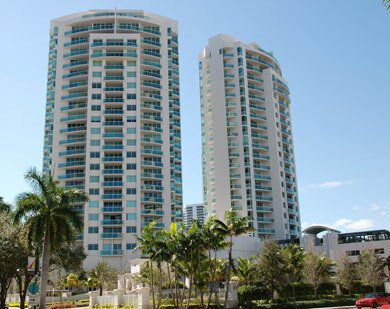 The Parc Aventura Condos are contemporary, elegant towers designed by renowned architects Behar, Font and Partners. The vistas from the towers take in the Bay, the Intracoastal Waterway, the city skyline and the fairways of Aventura and Turnberry. The Parc is ideally located near Aventura Mall and Turnberry Resort & Club. Each of the two 22-story towers is home to only 55 residences. Elevator opens directly into private foyer. Spacious, distinctive floor plans make the most of stunning views. Regal palms grace the impressive porte-cochere entry. Lobby finishes and appointments include exotic woods and elegant furnishings. Common area entry doors electronically controlled. In The Parc's well furnished Health and Fitness Center, residents will find: Cardiovascular and strength-training equipment, Free weights, Individual exercise stations, Dry sauna, Steam room, Massage/treatment roomsThe heated swimming pool lies amid a lush tropical garden. Residents also enjoy an outdoor whirlpool spa. The summer kitchen is perfect for barbecues and al fresco entertaining. The beautifully appointed Social Lounge offers billiards, media equipment and an elegant atmosphere for gathering.Those who entertain formally will find the Ballroom ideal for their private functions or casual get-togethers.The Business Center can help residents make the most of their time at home. The 24-hour manned concierge/security is centrally located in the lobby Closed-circuit system maintains residents' peace and privacy at all times. Valet parking attendants greet every arrival and departure under the porte-cochere. On-site Building Management Services provide quick response to any concern. Striking decorative gates enhance entries. Gates are guarded and controlled electronically. Floor-to-ceiling sliding glass doors lead to expansive outdoor terraces. Designer hardware is found throughout. Each residence is pre-wired for telephone, alarm system and cable television. Smooth finish ceilings enhance the clean lines of each room. Walls are primed for custom finishing. Glass terrace railings leave views unobstructed. Spacious Master Bedroom with direct access to terraces. Walk-in closets are spacious enough for any wardrobe. Imported marble covers the floor and shower walls. Clear glass shower enclosure. Recessed lighting is soft and indirect. Each Master Bath boasts a soothing whirlpool spa. Separate shower stalls are spacious and lined with marble. Italian cabinetry is capped with a marble slab counter top. Fixtures and accessories were chosen for their quality and design. Double vanity offers generous storage for him and for her. Separately enclosed bidet and elongated water closet are of vitreous china. Designer bathroom fixtures were chosen for their elegance. Elongated water closets are featured in every bath. Designer vanities add an extra note of refinement. Each bath features either a soaking tub or shower stall. Floors are of polished marble.